The Package Store opened in 1974 and was purchased by three of its employees two years later. As a family-owned and operated business, we have been serving the Hebron area ever since. Our experienced, friendly and knowledgeable staff is able to assist you with all of your beer, liquor and wine purchases. At The Package Store, we take great pride in the training we provide our staff so they can steer you in the right direction for choosing one of our many wine varietals or craft beer products. Whether you’re looking for a special liquor, a craft or import beer, or shopping for an organic wine or gluten- free beer, The Package Store has just about everything. Also take advantage of our "Make-a-Six" where you choose from an assortment of beers displayed in our coolers to create the perfect six pack! And if we don't have what you're looking for, just ask and we'll do our best to order it for you. 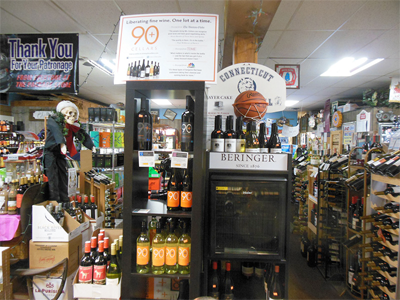 Stop by for your next purchase of beer, wine or liquor and experience why our customers keep coming back. We’re looking forward to serving you!